The curious visitor to a museum filled with zoological specimens and curiosities has to wonder: Who are the people who organize these collections? What stories do the collections tell? What makes them relevant? And what happens in natural history museums behind closed doors? Brian Gill’s Owl that Fell from the Sky takes the reader on a riveting journey into the rarefied world of a natural history museum. The curator of birds and other land vertebrates at the Auckland Museum, Gill provides a luminous, behind-the-scenes glimpse into the workings of a collection that contains thousands of avian specimens, including copious bones, study skins , and the eggs of extinct birds. Gill doesn’t hide or apologize for the strangeness of his world. On the contrary, the book celebrates the fact that the seemingly outlandish, obsessively documented objects that make up a natural history collection are actually closer to our everyday than we could have imagined. The Owl that Fell from the Sky presents fifteen anecdotal essays about the histories of the curious objects held in New Zealand collections, ranging from a gigantic stuffed elephant named Rajah to an enormous moa egg and a tortoise allegedly given as a gift by Captain Cook. The author weaves those anecdotes into a larger narrative thread that emphasizes how museums preserve a record not only of individual memory, but also of the biodiversity of our planet. Gill points out that natural history museums could not meet that lofty goal without the input of the public. “An unexpected telephone call or visitor, heralding what may be a rare or unusual find, adds spice to the natural history curator’s day.” It is this community involvement—and the conversations it ignites—that bring the essays in this book to life. as the plane landed in New Zealand. Some inquiries from the public verge on the surreal. Although bird identifications predominate, Gill is often asked to identify “dinosaur” bones, which usually turn out to be whale or horse bones. One anxious caller assumed that Gill would be able to identify a bird based on the similarity of its song to “a phrase in the third movement of Bruch’s violin concerto.” The questioners range as widely as the questions, from urban planners to students working on science projects to the speechwriter who desperately needs to know whether kiwis mate for life. One of the heroes of this book is Thomas Cheeseman, a self-taught natural historian who spent nearly half a century as curator of the Auckland museum. As we follow Cheeseman’s career from from 1874 to 1923, we see the city and its museum transformed into a professional institution in a budding colonial capital. The essays revolving around Cheeseman’s contributions remind us that museums are anything but stagnant; in fact, the specimens that make up collections often circumnavigate the world before ending up in a museum. Thanks to Cheeseman’s exchanges with far-flung institutions, the Auckland museum has ended up with birds from Siberia, China, and Sulawesi—and in return, museums across the world hold specimens from New Zealand. The tiny skin of a Black-thighed Falconet, for example, arrived in New Zealand on a particularly circuitous route, traveling from New Guinea to Auckland by way of Italy. What makes The Owl that Fell from the Sky such a lively read is that Brian Gill invites his reader to witness and participate in the work of his museum. We follow a taxidermist in his meticulous and slightly gory preparation of a nearly 9,000-pound elephant for display; we are privy to how the author himself skeletonizes an albatross, a Mute Swan, and two wallabies by burying them in his compost pile (with “worthwhile results”); we watch a talented young American prepare a terrifyingly vivid diorama of a Kea pecking at a bloody lamb. Like the collections he describes, Gill’s prose is filled with wondrous and surprising detail. Names, dates, scientific information—including a fascinating excursus on the requirements of the International Code of Zoological Nomenclature—and historical factoids fly at the reader quickly, voluminously, and sometimes out of left field. I found myself underlining and taking notes simultaneously, and almost always wanting more. On the one hand, I wished that Gill would slow down and dwell longer on the historical details, but on the other, I realized that the book’s design was different. The exuberant tempo of the historical background information builds toward Gill’s principal point, that natural history museum collections are modern—rather than arcane—institutions in the service of science and humanity. For instance, museum specimens can help biosecurity officers identify unknown and perhaps unwanted animals. Though stereotypes of the curmudgeonly, obsessive curator abound, Gill shows us another side of his profession: endless curiosity and remarkable knowledge coupled with a humble desire to learn more and to ask more questions, and a decidedly quirky sense of humor. The journeys of the objects and specimens themselves are often action-packed, and the stories they tell vivid and related with compassion. In a particularly moving passage, Gill follows the trajectory of the New Zealand skins sent by Cheeseman to a Florentine museum. Those birds “survived the turmoil of one hundred and twenty years of Italian history,” and were still lying on their backs in the drawers when in August 1944 New Zealand Army units entered a newly liberated Florence. History, both individual and collective, is woven into the narrative told by the objects in a museum collection. appreciated a bit more commentary from the author—and perhaps a conclusion—I realize that what Gill has done here is to emulate the very spirit of a museum collection, which urges the viewer to connect the dots and to shape meaning out of the discrete elements of a collection. We construct our own narrative based on the stories he has given us. In a sense, the stories Gill tells are simple, but they reveal a deeper concern about the ethical imperative to record and to remember, and a full awareness of the uncanny ability of objects to tell stories. – Julia Zarankin is on her way to becoming a birder. In her other life, she is a writer, editor, writing coach, and lecturer to later-life learners in Toronto. In her former life, she worked as a professor of Russian literature and culture at the University of Missouri. She writes regularly about birds, words, and other essential matters at Ontario Nature. Zarankin, J. 2013. 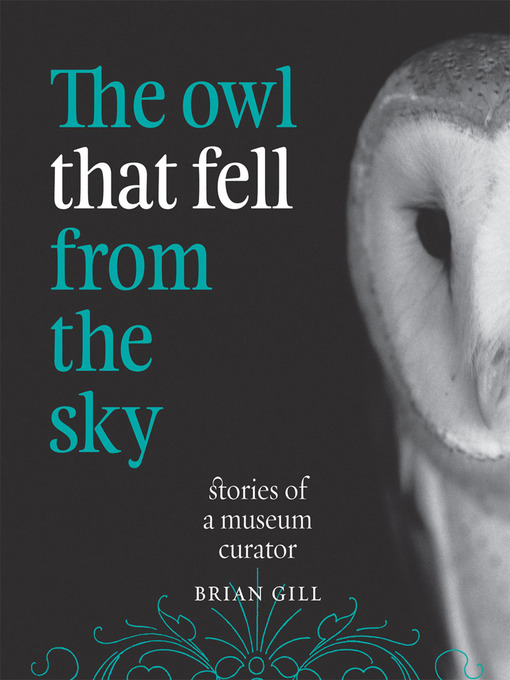 Behind Museum Doors [a review of The Owl That Fell From the Sky, by Brian Gill]. Birding 45(4):67.